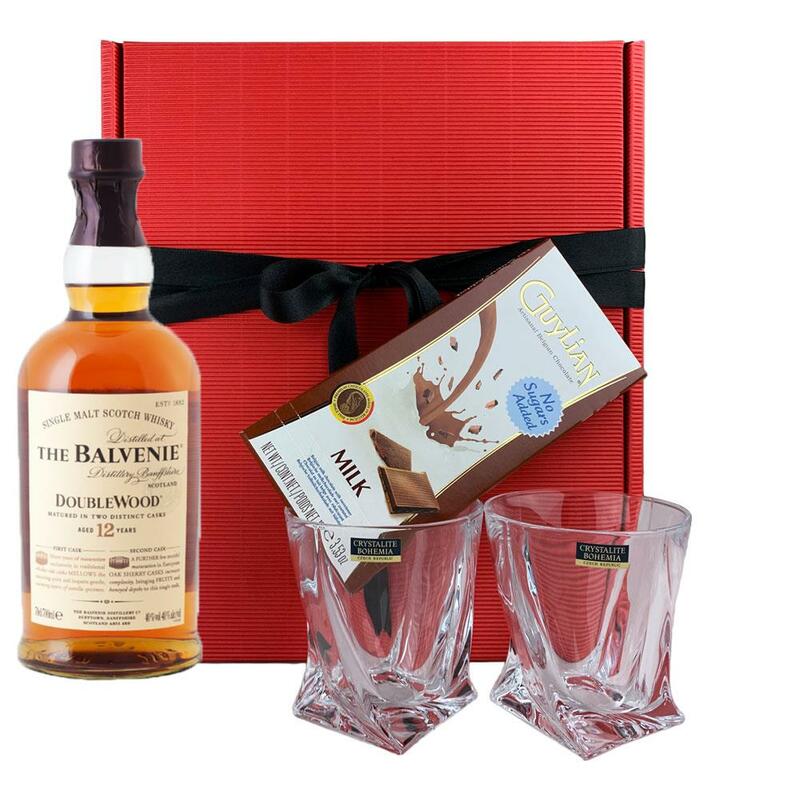 Buy this lovely Heart gift box and get and get a bottle of Balvenie 12 Year Old DoubleWood Whisky 70cl all packed together with a beautiful Crystalite Bohemia Quadro Tumbler with a lovely heart box of Guylian artisanal Belgian chocolate hearts. Presented in a lovely red gift box. The Balvenie DoubleWood has been matured in two casks - Traditional Whisky Oak and Original Sherry Oak which results in a rich mellow flavour of great depth and unusual complexity. An exceptional single malt. Sweet fruit and Oloroso sherry notes on the nose layered with honey and vanilla. Smooth and mellow to taste with beautifully combined flavours - nutty sweetness cinnamon spiciness and a delicately proportioned layer of sherry - with a long and warming finish This product is hand packed onsite by Gifts International, and is not affiliated with any other brand. Gifts International is responsible for this product combination/set.